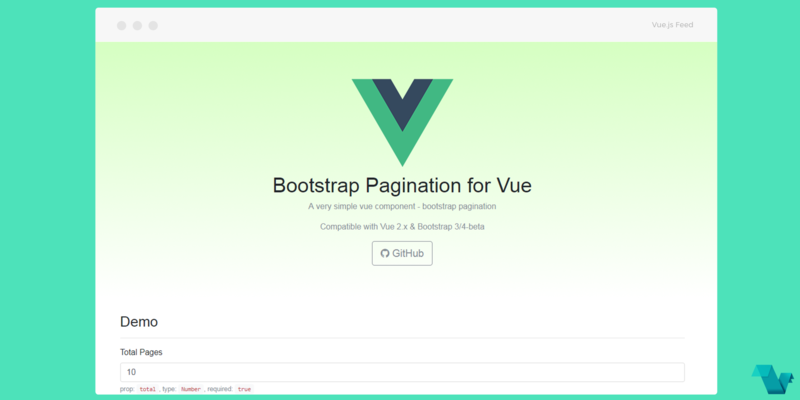 A Bootstrap Pagination component for Vue.js with simple options and setup. Live demo page where you can edit how many pages there are. Compatible with Vue 2.x & Bootstrap 3/4-beta. With the v-model directive you can set the number of the page that should be displayed in the begining and using eachSide prop to declare how many pages can stack in each side before the dots appear. This is it! This project's repository is hosted on GitHub.